Marcela Krejci (Czech Republic) supported the United Nations Educational, Scientific and Cultural Organization (UNESCO) in Ethiopia as a UN Youth Volunteer specializing in education from 2017-2018. Contributing her previous experience and knowledge in school management, Marcela helped UNESCO's International Institute for Capacity Building in Africa (IICBA) develop educational solutions based on ICT strategies from the grassroots level. Here, she shares reflections on her volunteering experience contributing to Sustainable Development Goal 4, ensuring inclusive and equitable quality education and promoting lifelong learning opportunities for all. 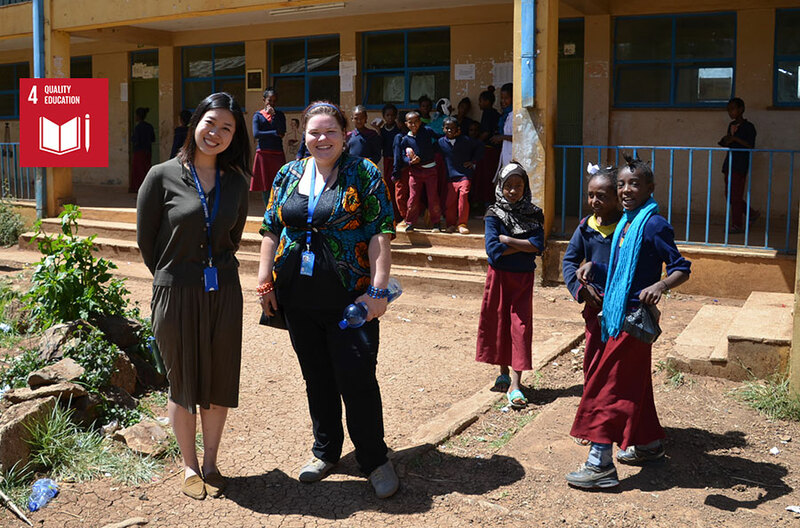 UN Youth Volunteer Marcela Krejci during a field visit to a primary school in Addis Ababa, where she worked on the preparation of an Africa Teacher Guide for Art, Music and Drama. As a UN Volunteer with the host agency, it was imperative that I take the initiative to find my place and learn how to work within the organization. The UNV field unit in Addis Ababa, gave me a great introduction to life in Addis Ababa. I was able to quickly adapt to the work and environment to fully utilize my skillset, acquired from previous nongovernmental organizations, and grassroot educational experiences to make a positive impact at UNESCO IICBA. To fully capture the landscape of the existing educational system across the African Union, I prepared a literature review draft on the use of ICT in national education policies across six African countries, including Ethiopia, Kenya, Rwanda, Tanzania, Uganda and Zambia. From there, the main task transitioned to the development of an educational model based on ICT strategies. Curating a sustainable framework requires foundational field work, as well as high-level conferences and meetings to create a well-rounded dialogue for change. As part of my work on the groundwork level, I prepared concept notes on “Tablets for Teachers”, an initiative calling for ICT integration in teachers’ education with emphasis on their development and paedagogical content. Additionally, I assisted in events aimed to inspire African youth to innovate in ICT. For example, my supervisor and I were actively supporting Technovation Ethiopia, a competition focused on helping young girls discover their capabilities in ICT innovation by creating a mobile app. It was great to see the 13 teams of girls between ages 13-18 discover their interest in tech. Eventually, a group of 4 girls won the price of 50,000 ETB for their fantastic app design! On the higher level, I often organized and participated in meetings with partners and stakeholders to discuss ways to implement good practices of ICT in school curriculums. These meetings yielded great personal and professional development for me. The entire trip was a great learning experience. For example, I attended the FAWE Conference on women’s education in Africa which took place in Lusaka, Zambia, gave me a new perspective on the education situation in other African countries outside of Ethiopia. The opportunity to share my experience in Ethiopia and Africa as a UN volunteer was the perfect ending to my journey. During my January 2018 visit to UNV headquarters in Bonn, Germany, I talked about my volunteering experience in a video made by the communications unit. Then together with other UN Volunteers from around the world, we produced and presented a report at the World Festival of Youth and Students in Sochi, Russia. These visits were very rewarding, as they deepened my intercultural competencies and knowledge while allowing me to share the highlights of my volunteering experience in the African Union. Overall, I truly enjoyed my UNV experience. Seeing how UN agencies work together and listen to the opinions of local and international non-governmental organizations for the betterment of local communities demonstrated the importance of peace and development cooperation in building a better world. I look forward to seeing the continual progress of UNESCO IICBA and other UN agencies in their work to find sustainable educational solutions in the African Union. This article was prepared with the kind support of Online Volunteer Alison Choi.